These three game concepts are chosen to be released on the Nintendo eShop! It is not sure that all of these games will be released. For now we want YOU to decide which one of these we shall develop! Please understand that all of them are in an early state of development - screenshots are from those very early [builds]! Please use the different threads to tell us what you like and dislike on each project. There will be an very detailed press article with tons of additional information soon! That's right, folks – you get to help them design their games and even which they'll develop first. You can discuss the projects within individual forum topics and look at some screenshots of their three prototypes, Niki Rock Ball, Niki Dream and PUZZLEBOX: Copycat Cubes directly below this article or in 3D here, as well as seven shots of Vektor Tank 3D+, using your 3DS browser. As the company has held a less than perfect track record until now, perhaps some fan input is just what it needs. Do any of these concepts grab your eye? Do any of them make you cry? Tell us in the comments, and then tell Bplus! Hey Brutus, Bplus wants to speak with you. They should have put shots on in 3D so people could check on their browser. Oh boy! This has been: a very sarcastic comment. Lets see I like Niki Dream and PUZZLEBOX: Copycat Cubes, Niki Dream looks like it could really utilize some of the 3DS's abilities. Stunning graphics and maybe some good 3D (Niki Dream). On a completely unrelated note, when's Chicken's b-day? Hopefully this will help them to make their 3DSware games better than their wiiware games. Niki dream looks trippy and although none of them seem like games I would get, puzzlebox: copycat cubes interests me the most. @Xkhaoz3D Thanks, I've edited the article accordingly. I just looked at the 3D screenshots on my 3DS and the 3D screenshots of Niki ball really hurt my eyes and the 3D screenshots of vektor tank 3D+ were a little hard on my eyes too but they weren't as bad as the Niki ball screenshots, the other two were okay though. MM Niki Dream and Niki Rockball please!! I finally forgot about B+. Thanks for nothing, NL. Wow, Niki Dream (and to a lesser extent, Rock Ball Niki) look really cool! Not so fond of PUZZLEBOX, though. I would want the cube one. From their track record they definitely need the fans to develop their next game. However, niki dream does look pretty cool. I have plenty of ideas, but then I'd want a share of the profits too. Or alternatively, I wouldn't mind following in the footsteps of one Chester J. Lampwick and settling for a one time fee of 800 billion dollars. Both of the Nikis look Beautiful! I hate to be the one to say this, but how about some good games? And how would you know these prototypes are bad?? 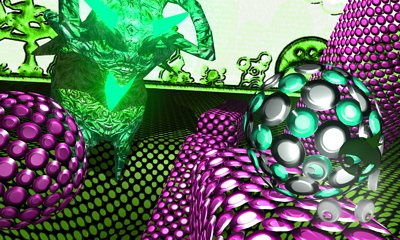 the 3D in Niki Rock Ball just.... makes your eyes go wierd for a second... It looks crazy to the eyes! Where was the option "Bplus, please shut down?" Sorry, I was just going according to their track record. Plus, I own Niki Rock n' Ball. Yuck. Maybe these new games will be good, maybe not. I wish them the best, but I won't hold my breath for anything of high quality. I have to admit though, I like the various art styles. I think I'd want Vectortank if done right. Niki Dream looks beyond fascinating... like everything's made up of atoms! All look good, but it's pretty hard to judge based on screenshots alone. No prob - I understand where you're comin' from though. Just sayin' that we haven't even tried any of these prototypes - can't judge too soon. It's nice to know they're givin' the community a choice though. It'd be nice if more companies did that. im a fan of picross games, and copycat cubes seems in the same league. ill get this one if it ever comes out. hopefully, they will include an editor. That would be really cool! Can't wait! Fix the physics, the gameplay, the AI. Then fix... everything else too. You should go into hiding, Chicken? I'm going to have to reformat my Wii so you can't gift the game to me. Sorry Bit Trip, you're not worth the risk. I think it's fan-tastic that they want the buyers to have input as to what they get offered. It's only makes (dollars and) sense and Nintendo could learn a thing or two from them. Based on pic alone I wuld like to see Niki's Dream and PuzzleBox. I know nothing about ANY of them at this point though. Niki Dream looks amazing....Niki Rock Ball looks interesting as well.